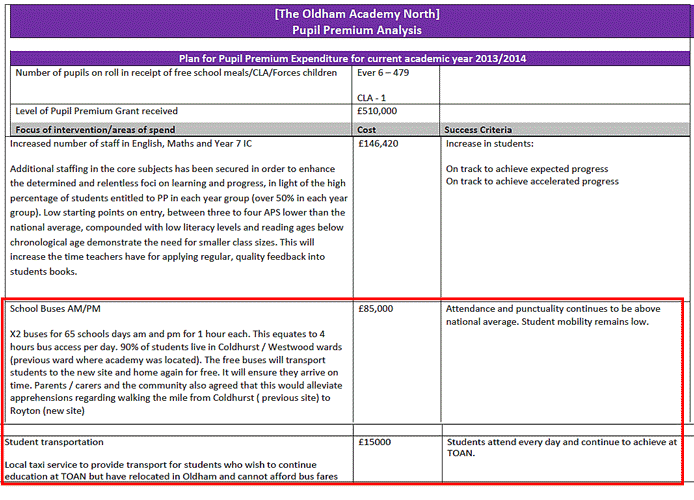 Oldham Academy North spent £85,000 on free bus travel, a fifth of it’s pupil premium grant. Oldham Academy North spent £85,000 on free bus travel & £15,000 on taxis which is a fifth of it’s pupil premium grant. The premium is additional funding given to publicly funded schools in England to raise the attainment of disadvantaged pupils & close the gap between them and their peers. The reason given was because parents in Coldhurst & Westwood felt apprehensive about walking a mile to Royton.